Russell Westbrook releases his first lifestyle shoe with Jordan Brand. Russell Westbrook puts a focus on fashion. From fur to flannel and wild prints to wildly tight pants, the Oklahoma City guard has a style that transcends the Midwest (well, really, it transcends even the NBA). 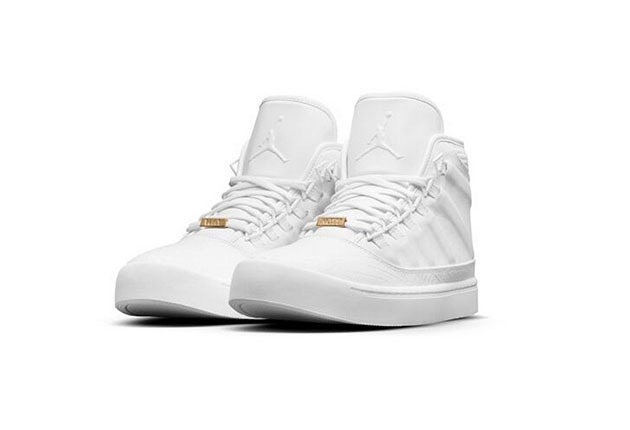 His first signature shoe from Jordan Brand, the Westbrook 0, takes that fashion-focused life to the design board, offering an off-court lifestyle sneaker, which is a new approach for NBA athletes and signature footwear. The Westbrook 0—the zero comes from his uniform number—debuts with a basketball silhouette in “premium leather” embossed with details. And eventually in five different colors. The high-top minimalist design, inspired by Westbrook’s “fashion-forward lifestyle,” contains such features as an “exotic reptile pattern” embossed on the toe cap and a webbed lacing system with a metal tag on the laces showing off Westbrook’s signature logo. Jordan Brand has released the black and white versions of the Westbrook 0, while the grey and red colorways can be expected on Aug. 1, just in time for the 2015 school and high-fashion shopping seasons.